AFC Mansfield moved swiftly to replace manager Rudy Funk after they parted company last week. Funk has been replaced by his former assistant manager, Mark Ward, who has taken on the vacant managerial position at the Forest Town Arena. 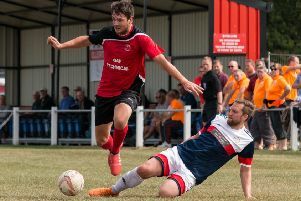 Ward moves into the hot seat with the Bulls fighting a battle against relegation from the Evo-Stik NPL East Division in their first season at the higher level. His appoinbtment continues his association with the club on and off the pitch. Ward joined the Bulls in the 2014/15 season as a player, and returned in 2016 as assistant manager to Funk after joining from Handsworth Parramore, where he had also been assistant boss. Bulls chairman Andy Saunders was extremely pleased to appoint Ward, saying: “I’m delighted that we have quickly filled the position and that Mark has agreed to take on the role. The Bulls insist Funk departed the club after four yrars in charge by mutual consent, although Funk says he was sacked but wished the Bulls well. Goalkeeping coach Graeme Rodger, who was at AFC Mansfield when the club was launched, has also left, resigning after Funk left to end a seven-year association with the Bulls. Saunders said: “We thank Graeme for the hard work and professionalism he has shown during his time with us.